Details: Carved stone surround entrance with railing above, stone belt course at eave line. 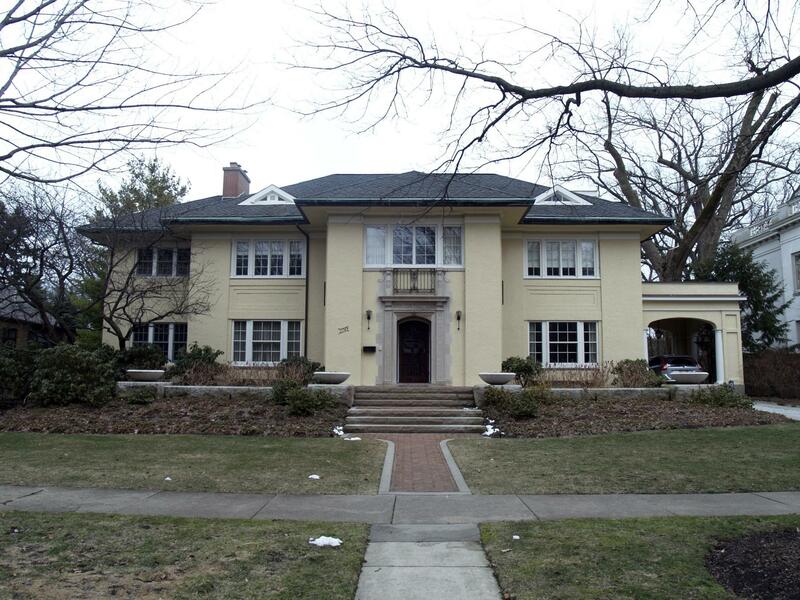 Historic Features: Stucco cladding, carved stone surround entry, porte cochere on west elevation, small triangular dormers on north elevation, recessed panels in spandrels between first and second floor windows; piers meeting at stone belt course at eave line, wide eaves indicative of Prairie stylistic influences. Alterations: New terrace, rear addition, and window replacement on north elevation. Original Architect: Tallmadge and Watson, attributed. 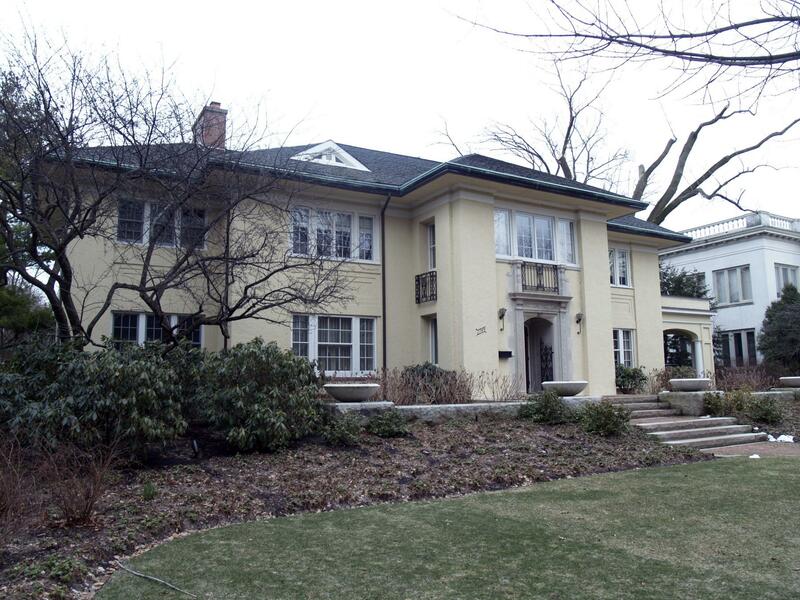 Moving Permit #: MP575 (as 2745 Euclid Park Place) 2-sty frame and stucco house moved here from 2603 Sheridan Rd. Exterior Alteration Permits: 11MSWK-0111: Remove existing front stoop and walk, install new stoop and front walkway 08AIR0000000007: Win replacement, add and rear interior alters; on 2008.18.3 3/18/08 HPC approved project, COA issued on 2008.19.3, final drawings pending. COA Info: 11PRES-0214: Remove and replace deteriorating front concrete stoop, steps, walk and piers. 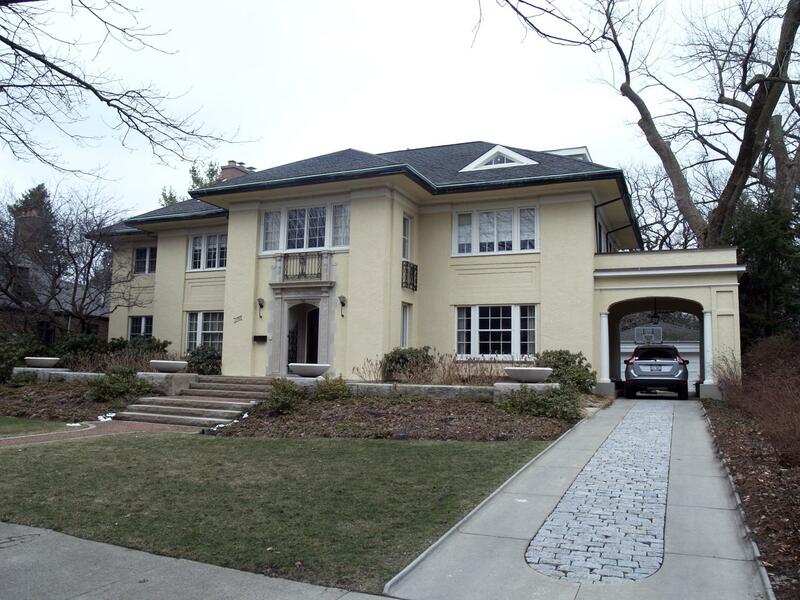 New stoop material is Indiana limestone; the stoop inlay and walk are clay brick pavers (matching bricks at chimney), new stoop dimensions to match existing, add two 24" high piers on either side of stoop, in between the two piers, a 20" high low garden wall of Indiana limestone is proposed, construct a walkway connection from front stoop to existing driveway to the S; 08HIS0000000022: Remove win and replace w/ wd wins (W/N/E/S), remove 2 flr wins and increase sill height replace w/wd wins (W/N/E), new win 2 floor (N), remove glass block wins and install wd wins 1st flr (N), remove wins and enlarge window openings, install wood windows 1 and 2 flr (E/S), remove French door and replace with win 2 flr (S), build bay w/windows 1 flr (E).